Great to hear that On Stage Lighting has helped you and that you value my efforts for quality and unique stage lighting content. We share a common interest! Don’t you think that the resources and information you’ve enjoyed are worth a coffee? Like me, you also probably like discounts. Readers that make a donation will also be immediately be eligible for discounts on upcoming online courses with me at Learn@OnStageLighting. The courses include DMX Stage Lighting Systems and Introduction To Busking Stage Lighting. It’s safe, easy and I sure appreciate it when visitors to my site send their thanks and it keeps the site servers running. I’ve received a coffee from so many On Stage Lighting readers so far that my family have made me switch to decaff! 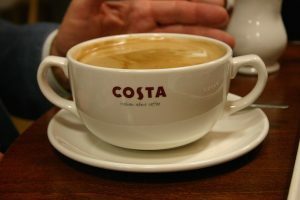 A coffee is only £2.90 here in the UK. It’s still a nice way to say ‘thank you’. My thanks to you: Even more exclusive stage lighting help! In return for your kind thoughts and a coffee, I’ll send you details of how to take advantage of your discounts AND a link to join our exclusive backstage Guest List to get unique stage lighting content that isn’t available at the ‘public’ face of the website. I expect you’ll know that being ‘behind the scenes’ is where the real magic happens – On Stage Lighting is no exception. The Guest List has over 1900 members but I now have only a limited number of guest slots left for really enthusiastic On Stage Lighting readers. Would you like to come and join us? Click here, say thanks and I’ll send you the discounts and link. Rob Sayer, On Stage Lighting.